Paris and all its magic . . .
Cyrano de Bergerac meets Chocolat and Amélie in this intelligent, charming, and entertaining publishing sensation from Europe. 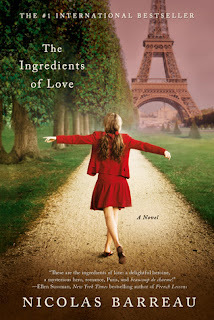 While in the midst of a breakup-induced depression, Aurélie Bredin, a beautiful Parisian restaurateur, discovers an astonishing novel in a quaint bookshop on the Ile Saint-Louis. Inexplicably, her restaurant and Aurélie herself are featured in its pages. After reading the whole book in one night, she realizes it has saved her life—and she wishes more than anything to meet its author. Aurélie’s attempts to contact the attractive but shy English author through his French publishers are blocked by the company’s gruff chief editor, André, who only with great reluctance forwards Aurélie’s enthusiastic letter. But Aurélie refuses to give up. One day, a response from the reclusive author actually lands in her mailbox, but the encounter that eventually takes place is completely different from what she had ever imagined. . . . Filled with books, recipes, and characters that leap off the page, The Ingredients of Love by Nicolas Barreau is a tribute to the City of Light. Paris? Romance? Comparing it to Amelie? Have an awe inducing synopsis? It basically the epitome of awe-inducing. I really want this for Christmas now!